Understand that multiplication is extended from fractions to rational numbers by requiring that operations continue to satisfy the properties of operations, particularly the distributive property, leading to products such as (-1)(-1) = 1 and the rules for multiplying signed numbers. 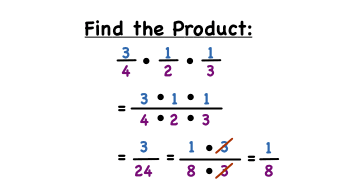 Interpret products of rational numbers by describing real-world contexts. Understand that integers can be divided, provided that the divisor is not zero, and every quotient of integers (with non-zero divisor) is a rational number. If p and q are integers, then -(p/q) = (-p)/q = p/(-q). Interpret quotients of rational numbers by describing real-world contexts. What's the Reciprocal Rule of Division? When you divide fractions, the trick is to rewrite division as a multiplication. But the truth is that you can always rewrite division as a multiplication, and in this tutorial you'll see the rule that makes that possible!